Catawba Valley Brewing Company in downtown Morganton concocts a happy assortment of beers that are almost as fun to say and describe as they are to drink: Mother Trucker Pale Ale with its pine aroma, White Zombie Ale with its coriander and hint of citrus, Farmer Ted’s Farmhouse Cream Ale with its free-range yeast. One of Catawba’s beers is even brewed with autumn in mind, intended to be quaffed during the peak of fall activity in the Blue Ridge Mountains, the red-and-gold days that bring out bagpipes and lederhosen and orange-colored suds: King Don’s Pumpkin Ale. It’s difficult to bottle something as fleeting as mountain leaves, green one day and yellow the next. It’s complicated to evoke the feel of a hiking boot hitting in a mud puddle, or the tangy crunch of biting into a red apple, or the smell of first smoke coming from a neighbor’s chimney. October brings a special challenge to the brewers sprinkled across the mountains. You want something that tastes like it trickled out from under a boulder, or through a rock wall on the Blue Ridge Parkway. It’s got to say all the words that come to mind when the forest canopy clears and you can see Grandfather Mountain poking up in the distance. That’s probably why Pyatt calls King Don’s his most complex beer, made with five barley types and spices normally reserved for baking. He chooses pumpkins from a family farm in McDowell County. Big ones. Small ones. Lumpy. Lopsided. All of them work. People drink it and swear it smells like gingerbread. They’re disappointed when they finish an entire growler during a tailgate party. It’s beer, the specialty of the Blue Ridge, exploding in popularity nationwide, brewed for the region’s best moments. Fall is high season for seasonal beer, whether or not it’s brewed with a pumpkin. Red beers. Harvest ales. Oktoberfest beers in steins the size of a coffee can. The original festival in Bavaria may have started to celebrate the marriage of King Ludwig I, but in the Blue Ridge, it signals a time to jettison all the summer wheat beers and drink something hearty. As its beer scene continues to spread across the country, North Carolina now plays host to more than two dozen breweries in the mountains alone: Green Man, Blind Squirrel, Wicked Weed, Frog Level, and French Broad, to name some of those you’ll find waiting in taps. A generous sample of these locals turns out at Asheville’s Oktoberfest — an event that formerly capped its attendance at 2,000 but has now grown large enough to move out of downtown to the South Slope, where many of the breweries in Beer City — as Asheville was designated in 2012 — reside. Festivities feature stein hoisting, keg rolling, and Viking helmet wearing. Remember that only a few decades ago, western North Carolina did not have any local breweries. Then came the now-defunct Smoky Mountain Brewing Company and then Highland Brewing Company. Now the region’s oldest operating beer maker, and one of the largest in the South, Highland takes the changing seasons very seriously. It unveils a special beer for each time of year and names it for a North Carolina peak. Highland’s fall beer is Clawhammer, an Oktoberfest Marzen inspired by the climb in Pisgah National Forest near Brevard. The brewery will lead its annual celebratory hike up Clawhammer in October with a sample of the seasonal brew waiting at the top. It takes a little extra time to brew Clawhammer, and the beer takes up more tank space. It’s smooth and drinkable, not bursting with hop flavor, and weighs in at about 5 percent alcohol. So it’s meant for active times, for hikes with beers in the backpack, for creating the warmth on your skin that comes from spending a whole day outdoors. For Highland, the fall beer is a chance to enhance the company’s brand, to show that it embraces the commitment to the spirit of land conservation that makes Asheville so Asheville. All the peaks on its seasonal beers are named for protected land, and by celebrating the peaks in peak leaf season, Highland is connecting the region’s twin passions for scenery and good beer. 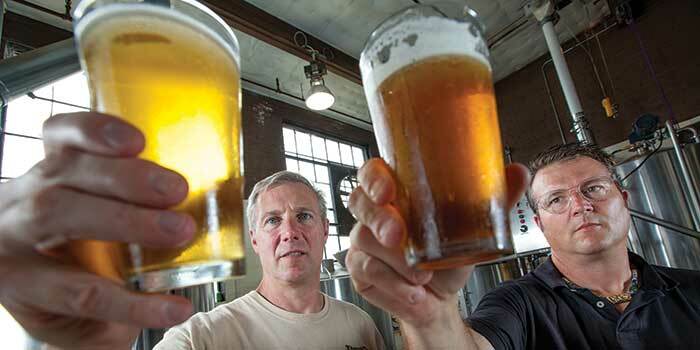 “Clean water means good beer,” Stevenson says. And good beer, along with a canteen full of cold water, makes good company on the trail. Down the road in Black Mountain, Dave Quinn dreads the fall like a firefly laments the sunrise. As big a deal as it may be in the mountains, and despite the crowds it can draw, the change of season means winter is near. The vibe at Pisgah Brewing Company feels strongest in the summer, when the open-air taproom fills with mountain visitors debating whether to push farther west to tour Highland’s brewery or drop their kayaks in the Swannanoa River. Just last summer, jam-band heroes Moe played to 1,500 people outside Pisgah’s taproom; the reggae musicians of Steel Pulse have drawn another 2,000. Alt-country singer Lucinda Williams has been known to stop by and try out new material. On a lazy Saturday, crowds drop by Pisgah to fill their growlers and end up spending the afternoon, finding the bar stool and pint to be an irresistible lure. Quinn himself gives off a warm-weather feel. A few years back, he took a long sabbatical from Pisgah and the Blue Ridge and he drove with his dog and a copy of Travels with Charley in a converted camper to California, where he followed the surf report and occupied a stool at Port Brewing Company. But Quinn, an award-winning brewer, returned, and now the Pisgah co-founder responds to the chill in the air with his Equinox, a malty India pale ale with a hint of chocolate. There’s also Valdez, a coffee stout which he hints could be named for the Colombian coffee-bean icon, the Alaskan port, or Valdese, the mountain town that stands 50 miles to the east. Brewing is a bit of mad science, a craft tuned in to changes in temperature. You think about the light taste a summer drinker will prefer versus the higher-alcohol warmth craved by a cold-weather beer fan. But whether it’s Catawba’s pumpkin flavor, Highland’s hike, Pisgah’s coffee ingredients, or any of a dozen other creations, the pint glass takes on the color of a trail strewn with fallen leaves, smelling like a fire under a pot of apple butter and tasting like autumn in the mountains.